You have the power of choice, the power to change, the power to be you, the one you were born to be. This page is all about honouring Planet Earth. The Tibetan name for Mount Everest, Chomolungma, translates as Mother Goddess of Earth. Planet Earth has had everything to do with all the major things I have done in my life that have led to where I am now - summiting Everest, sailing the Atlantic, climbing, skiing, living, breathing. We are intrinsically linked to the earth and I believe that should be honoured in whatever ways are possible. 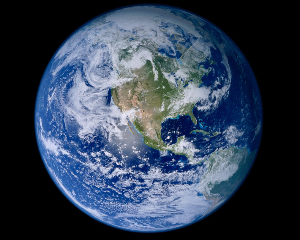 I am proud to be a member of an organization called One Percent For The Planet which is about people connecting with people...and with the planet...and giving back to the planet what we take. It was founded in 2001 by Yvon Chouinard - owner and founder of the company Patagonia - and members pledge to give 1% of their profits to environmental groups around the world - protecting the natural resources that keep them in business. It is in fact all about keeping Earth in business. Earth wasn't made for us, we are just part of it. The Earth will go on being the Earth when we are no longer here. I am also a Trustee of the Planet Earth Trust. We spend all day, every day on this Planet and most of us most of the time are encapsulated in our own little bubble and forget that we have any connection at all to Mother Earth. But believe me we do.... we are all connected...to everyone and everything. All those little coincidences in life...you know...where you're thinking about someone and they telephone, that sort of thing.... think they're coincidences? ?